Photo from a post-card mailed in by Jim Barton, THANKS! 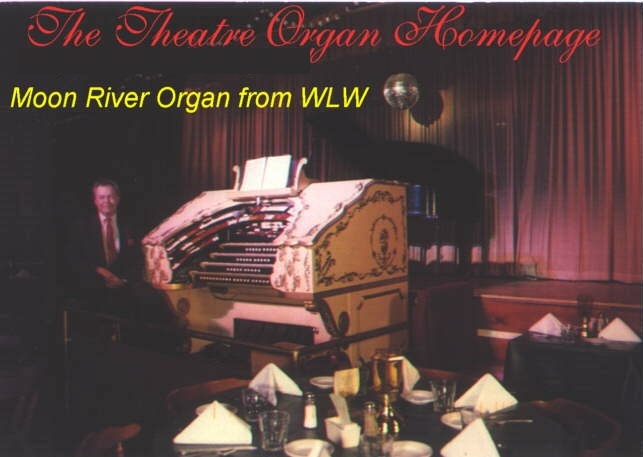 Rick Omert stands by the famous WLW Moon River organ, so named because of the late nite broadcasts of the same name that featured this organ's music. This organ was originally installed in WLW Radio, the famous station that was granted superpower back in the 1930's to operate with 500,000 watts from Cincinnati. (The old transmitter still exists at the WLW site near Cincinnati.) It was during this time that WLW earned its slogan, "The Nation's Station". This organ is now located in the Shady Nook Restaurant on US 27, Millville, OH. At least one story in radio circles says that the owner of WLW, John Crosley, came in one night to the studio and Fats Waller was playing one of his own numbers on this organ, "Ain't Misbehavin", and that upon hearing this song on the mighty Moon-River organ, Crosley fired Waller, as that song was "disrespectful of the organ" which had been dedicated to Crosley's mother. Those were the days when all radio was live...and many stations had their own organs and orchestras for that matter. Whether or not that story is true has not been confirmed. If you have not seen it, the movie recently released "Radioland Murders" (available at any Blockbuster) is a film that takes place in a radio station of yesteryear, and yes, there is even an organ in the radio station in the movie. 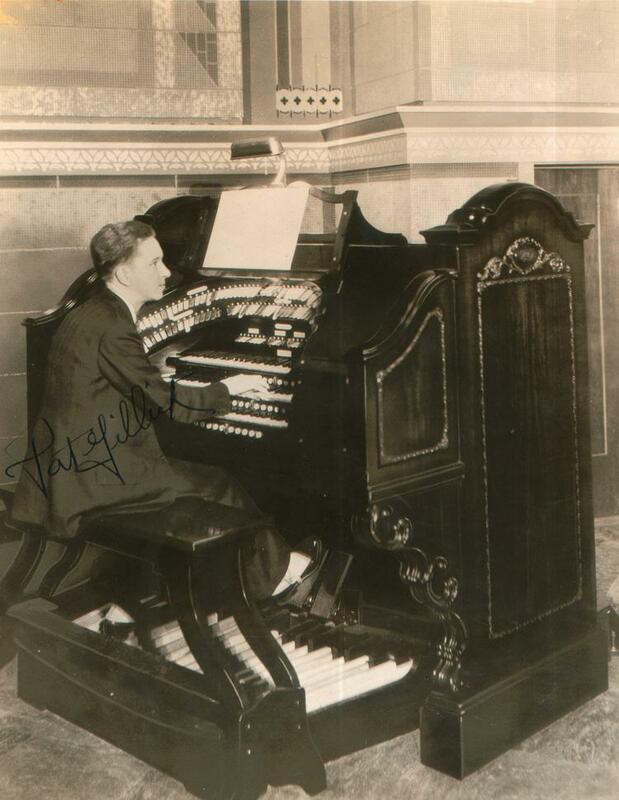 An original photo signed by staff organist Pat Gillick that clearly shows the real unit was a 3 manual console. Submitted by dburns02@harris.com. 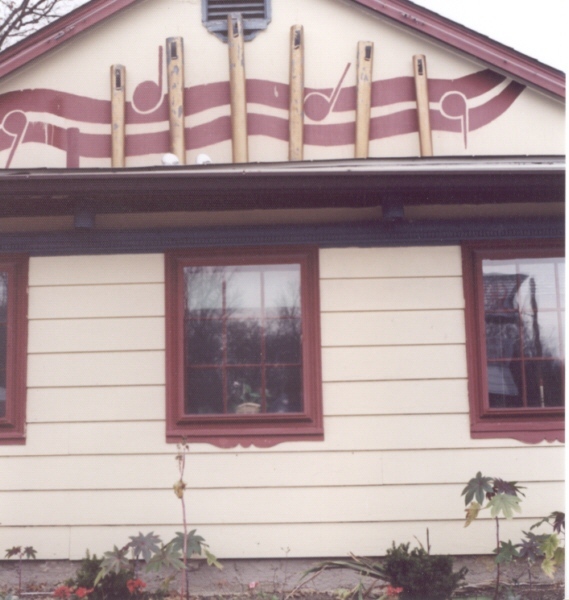 This photo postcard scan of the WLW studios was sent in by Steven R. Scherer scherer@purdue.edu a Cincinnati area historian. Surely there are some better photos of the organ out there. Those of you that also enjoy radio nostalgia will enjoy visiting Steven R. Scherer's home page about the Crosley Radio Corporation http://fairway.ecn.purdue.edu/~itf/crosley.htm. Those who enjoy old radio receivers will enjoy a visit to Jim's Crosley Antique Radio Page And for those Super Brave Souls that enjoy the technical end of radio broadcasting, don't miss the "WLW Transmitter Page" featuring pictures and stories of the golden age of radio back when the organ was on the air every night. During the late months of 1930, and the depths of the Great Depression, Powel Crosley, Jr., owner of WLW, called his people at his radio station. He told them to come up with a new sign-off program that would be soothing and relaxing. "None of that dance music" he ended, "and I want it ready for airing tomorrow night." The original Moon River program included a violin, female trio, narrator and theatre organ, naturally! The program aired well into the early fifties before it was pulled from the broadcast listings. Where nothing is but sleep. Care will not seek for thee. Moon River, to the sea. Flow the bright waters of Moon River. In the loveliness of sleep. 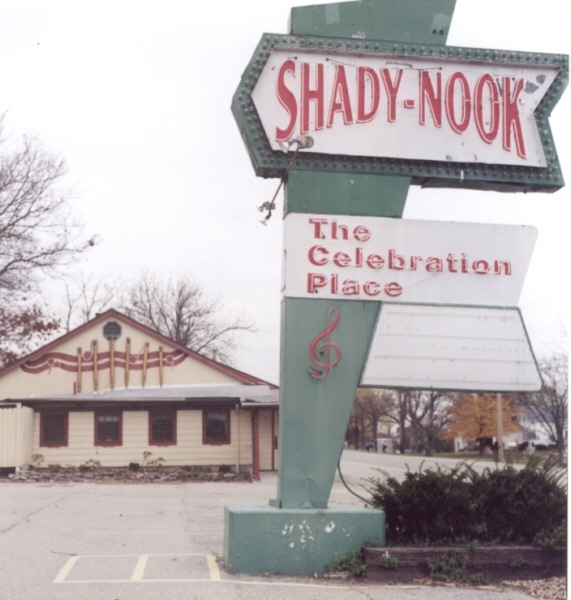 I just wanted to let you know of the current status of the Shady Nook Organ in Cincinnatti, Ohio. The organ has been in sad shape for a while now, and this past month, has completely given up. The organ is no longer playable. Plans to get it working again are in the works, but the management has no money available, and are looking at getting insurance money to help. Rumor has it that "lightning stuck the relay". The restaurant is still open, and keyboards and piano are played. I was on staff as a substitute organist there for a couple of years. The organ had no combination action. Pistons were actually used for some sound effects. Registration was completely by hand. The lift is just a forklift motor stuck in the basement, so if you tend to bounce around while you play an upbeat number, you litterally bounced the entire console on the lift. The first time I did this, I thought that I was going to die! As I hear more on the status of the organ, I will let you know. Email the Webmaster if you can provide any additional photos or information on this subject! My greatgrandfather was Powel Crosley he owned WLW. The story goes like this;he purchased the organ and installed it at the radio studio which was then located in his arlington street factory where the crosley radio was produced.He did dedicate the organ to his mother but he never fired anyone from misusing it.He asked the band leader,Eddie Byron house band to compose romantic organ music and poetry,which his mother loved very much,to be broadcast on the following evenings program.After the station had gone off the air Eddie and a well known violinist retired to a speakeasy for drinks.Powel would not have been so proud if at the time he had known this was the birthplace of moon river.After a couple of drinks he began thinking of his childhood and where he had grown up,with the moon on the river as it would sweep by gently,he started writing this down.As he was writing the violinist was playing his favorite concerto and in combination with the poetry of Eddie Byron the WLW program moon river was born. 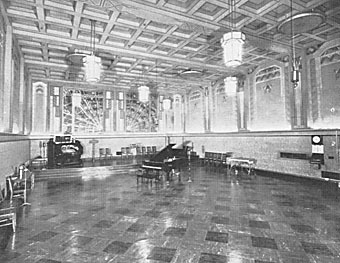 I have been told that the 4/32 Wurlitzer in the Shady Nook is actually the "Moon River" organ, although I have also read that there were multiple organs in the WLW studios. At any rate, if you are ever in the vicinity of Oxford, Ohio, be sure to stop by the Shady Nook. The Wurlitzer is played nightly from 6-9 PM and Sunday afternoons, and the home-style food is excellent. If Betty Satterfield is playing, you might be even be able to persuade her to let you play a tune. When we visited recently, Betty let my eight-year-old nephew ride the console down into the pit and back up with her. Needless to say, he was really thrilled and is still talking about the experience! With fine musicians/goodwill ambassadors like Betty, maybe the future of the organ is brighter than we think. The Shady-Nook Theatre-Restaurant is located at 879 Millville-Oxford Rd (US 27), Hamilton, OH 45013-4381, Phone: 513-863-4343. If you have any additional information about this organ, please email The Webmaster We would love to have some pictures of this organ installed in the Radio Station. You have a fantastic website. I am a Cincinnati radio historian and wanted you to see the attached .GIF file. This is a blow-up view of an organ from a postcard I aquired.